Youngite hasn't been readily available for years. We bought this material decades ago and recently found it in our "archives". Youngite glows bright green under UV light (black light)! It is a pretty pink brecciated agate with a translucent background and a drusy coating. Youngite makes pretty gemstones and awesome fluorescent specimens! Wearing jewelry made with Youngite stones at a party with a black light atmosphere will produce a lot attention. 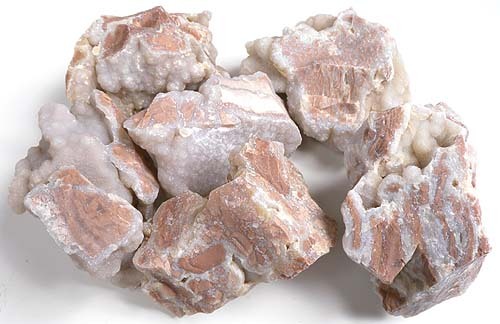 Since Youngite is an agate, it is a microcrystalline form of quartz. As with any microcrystalline quartz, it is hard and takes an excellent polish with cerium or tin oxide. Youngite can also be polished with diamond. Triangular shape measures approximately 2-3/4" x 2-1/4" x 2 to 1-1/4" thick. Two stone parcel measures approximately 2" x 1-1/2" x 1-1/4 to 1" thick and 1-3/4" x 1" x 1 to 7/8" thick. Measures approximately 2-3/4" x 2" x 1-1/2" thick. Measures approximately 2-1/2" x 2" x 1-1/2 to 3/4" thick. Two stone parcel measures approximately 2-3/4" x 1-1/4 to 1" x 1/2" thick and 1-3/4" x 1-1/4" x 7/8" thick.